From a dedicated Cinema room to a simple surround sound system to enhance your TV, Home Cinema can provide an enhanced movie experience for the whole family. This is where Technophobe is able to draw on many years’ experience of supplying and installing high performance cinemas in a wide variety of rooms. In a confusing market with a glut of equipment, forever changing technology and format,Technophobe cuts through the jargon, relying on its extensive experience to provide recommendations based on your requirements, to guarantee a Home Cinema that is top quality, aesthetically pleasing and simple to use – the Technophobe standard. A control system to make these complex systems a breeze to operate for all the family is a must for any Home Theatre. For example, Technophobe suggests that the room’s lighting system is redesigned and if necessary black-out blinds fitted so that there is no compromise in performance for the Projector, which typically requires a darkened room. The lights and blinds can then have their operation automated and controlled by the same control system that will be custom programmed to control the rest of the Cinema. 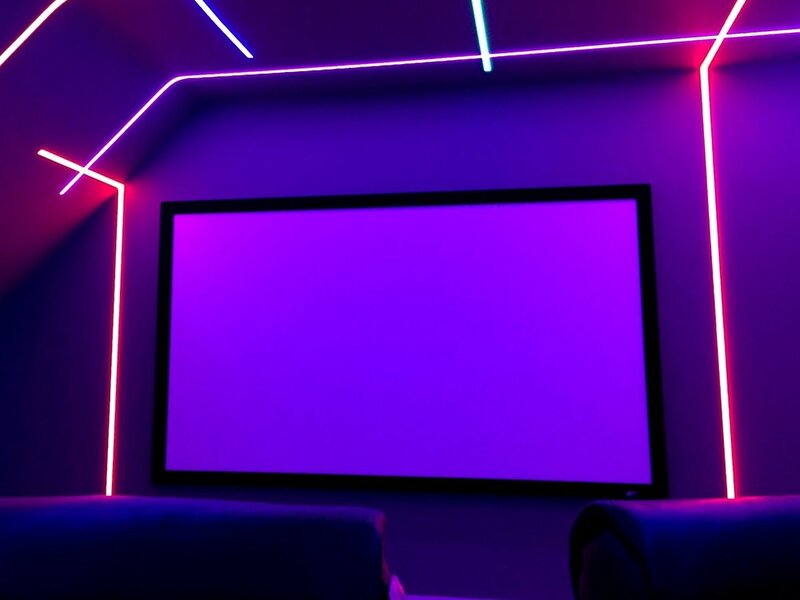 If you are planning a dedicated Cinema room, we can provide a complete design service to include furniture, lighting, acoustic treatment, as well as the electronics, taking the whole Cinema experience into a high-tech and deluxe dimension! Not everyone has the space for a dedicated room. At Technophobe we are experts at hiding Cinema systems into the typical living room, so that you can achieve your dream of a Home Cinema that will disappear when not in use, without compromising on performance. Using drop down Motorised Projection Screens and Projector Lifts we can create a large screen cinematic feel without intruding on the look and feel of your Living Room. The beauty of lighting control in your home allows you to select the type of lighting scene you require at the touch of a button, achieving elegant and efficient lighting in the room of your choice whilst reducing energy and environmental damage. Furthermore, a lighting control system provides automatic switch on/off of lights via timed events, motion and light sensors. So having your lights set up in this way means that those lamps will not be left on once a room is no longer in use. A complete whole home lighting system by Technophobe does not just provide lighting on a room by room basis, but will also give whole home settings that can be accessed by the push of a single button. This enables you to switch off all the lights in the house as you leave (or back on as you return), or switch the entire house into holiday mode as you go on vacation. In addition to the security benefits, lighting control can enrich your living experience by providing pre-programmed lighting scenes that will allow you to have, for instance, a beautiful low level lighting scene for entertaining in your living room, which becomes in turn a new scene for watching a movie in the same room and even a bright setting for when someone spills the popcorn! Not only can you enjoy a lighting control system programmed to enhance your room’s décor and suit your purpose, you can also be assured that Technophobe have installed a system that will reduce energy usage and prolong the life of your lamps. Setting up your lighting control system to run your lights at a lower capacity is just one of the things we do to ensure that your home can, quite simply, meet a tighter, more energy efficient lighting plan. Unlike a conventional lighting system, a lighting controlled system will typically save a minimum of 10% in energy, per light fitting, achieving the twin-benefits of reduced running costs and energy saving. Add in the benefit of a limitless possibility of controlling any type of lamp including today’s latest LED lamps means that you can really manage your energy consumption at a low level. use today’s very latest energy efficient lamps and have a wealth of products we can call upon for a given décor and/or technical requirement. These products have been tested by us and chosen for their aesthetic appeal, specific light output, superior quality, and compatibility with our lighting control systems. We have selected the finest lighting control equipment from our valued trade partners. To find out more about the companies that we are proud to represent then please click on the links below. We are proud to have had one of our lighting installations featured on the www.thefabricofthings.com website featuring Philips Dynalite lighting controls integrated in to a Control4 home automation system. Click here for more. A bespoke home automation system allows you to control virtually any device in your home or business, automatically. As a Control4 certified custom integrator we at Technophobe work with home and business owners to deliver the transformative benefits of the smart and connected home: convenience, peace of mind and an efficient environment that’s comfortable and safe. We use Control4 products to integrate with a wide range of household electronics. From entrance gates to televisions and swimming pools to heating, the strength of Control4 is in it’s versatility. Founded in 2003, Control4 deliver an elegant, more affordable way of controlling lighting, music, video, security and energy in a single room or throughout the home. To date, Control4 solutions interoperate with more than 7,000 third-party consumer electronics devices. Partnering with the biggest brands in consumer electronics, appliances, energy, lighting and home security, Control4 leads the industry in interoperability, ensuring an ever-expanding eco-system of devices will work together in the home or business. Our Case Study details a recent project in home automation, completed successfully by Technophobe, demonstrating the multiple benefits of a “smart and connected home”. Click here for more. Our Music Systems are some of the best sounding and looking systems in the world. Why is this? With a background in High-End Hi-Fi Jamie Marshall spent 11 years sourcing, selling, importing and installing the very best A/V systems that money can buy. The list of equipment that Jamie has knowledge of is stagering! From the bigger (for a specialist company) brands such as Krell, Boulder, Wilson Audio, Quad and Martin Logan to some of the smallest but very specialist brands like Balanced Audio Technology, Rockport, Ypsilon and Kharma not many other people in the UK have experience of such a selection of equipment. This experience means that a Technophobe audio system will have been selected and installed with the same level of thought and care as any of these High-End brands. This means that we will always make sure that no matted what the equipment it will alway be setup and tuned to sound at its best. What is Multi-room Audio & Video? Multi-room Audio and Video is a way of enjoying your favourite music or TV/ movie in any chosen room in your home without restrictions. The systems that we install are designed to be both premium quality and extremely simple to use. You choose your preferred sources – Radio, Blu-Ray, Music Server, Sky/Virgin TV, Movie Server, iPod – then we custom design, install and program your Multi-room system to control these sources from anywhere around the house, or even outside. Using today’s latest Multi-room audio and video equipment we can install high quality wired and wireless systems into new builds or existing homes, all controlled via dedicated remote controls, keypads and touch panels on walls, or even the latest smart phones and tablets. We use many different types of loudspeakers to ensure high quality audio without compromising the look of your home. From in-ceiling speakers to ﬂoor standing hi-fi speakers, to speakers designed as art work and even invisible speakers that are plastered over to become part of the wall. These products are all sourced and selected by Technophobe and have been tested to meet the most exacting of standards. Future proofing our homes is vital to ensure that your home is connected and ready for the latest technology. Structured cabling is a system whereby cables for computer networks, audio/ video systems, home automation, CCTV, television distribution and control of other household technologies are planned and installed into your home, rendering it future-proof! This means that while your mind and finances are concentrated on the essential building decisions you need to make (when it is difficult to imagine what your future technology needs and budgets may be), we can install a system of cables to ensure that any equipment on your future wish list can be installed at a later date, without needing a complete rewire of your home. By installing a hidden structured cabling system, you can be certain that when you are ready to make the commitment the network is there for you to use to enjoy the latest technology.